Keeping up the supply chain to support Australia’s flourishing mining sector is the toughest task in today’s transport industry. Every bad decision can cost hard cash, so people think twice who to entrust a job to. Backed by Fuwa K-Hitch and Howard Porter, Giacci has become one name to call on when the bar is high. It is safe to say that even if there is no unforeseen problem, supporting a mining project in the middle of nowhere is not a walk in the park. But if the project is named ‘Peculiar Knob’, you know that you signed up for a whole new challenge.Located 770km northwest of Adelaide and some 90km southeast of Coober Pedy in the heart of South Australia, the Peculiar Knob project is a relatively young mine focusing on the delivery of iron ore. First sales from Peculiar Knob are scheduled for the fourth quarter of 2012. Knowing that the job won’t be a cruise down the road, Giacci consulted Howard Porter’s Roy Lombardi, an expert for the design of heavy-duty equipment, but also included axle and suspension specialist Fuwa K-Hitch right from the outset to make sure both chassis and running gear resonate with each other and are up to the task.The result is a prime example of application focused engineering: Each heavy-duty body is made from Q&T 450 grade plate and capable of enduring even the harshest punishment, even when loaded with up to 180 tonnes of iron ore rock material. Every combination is pulled by a Kenworth C510 tri-drive prime mover, the largest capacity Kenworth truck available on the market.“We recently upgraded the Howard Porter factory to accommodate large orders such as Giacci’s at the one time, hence why we were able to complete and freight all 14 road trains down to their mine quickly,” Roy says, noting that the strongest tipping body is nothing without a solid under carriage. “In the case of Giacci’s requirements for the mine, it came down to the availability of the parts we needed. Fuwa K-Hitch was able to accommodate us in the time frame we specified, at a cost-effective price with proven ratings on their equipment.” That’s why Howard Port recommended an axle and suspension combination by Fuwa K-Hitch – and even included the equipment specialist in the design process so all components would work well together in the field. 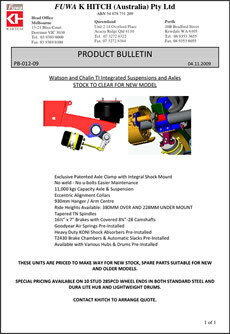 “Experience has shown that Fuwa equipment is capable of tolerating the punishment of working in a mining environment, particularly in an off-road situation,” says Joe, who settled on Fuwa K-Hitch’s 17-tonne heavy-duty drum axle and mechanical spring solution to achieve ultimate strength and stability.“It’s all about the stability in navigating off-road, and the Fuwa K-Hitch drum brake axles are strong enough to handle the heavy loads if we come to a stop,” he says. “Using disc brakes doesn’t make sense for us because the dust is everywhere, and combined with the heavy salt content in the water it can damage the brakes very quickly. “Working in the mining industry is different to our normal bulk haulage operations in that the strain virtually never stops, so our equipment must be protected at all cost. That’s also why we opted for a heavy duty spring suspension as we believe it’s ideally suited for the mining environment because it’s fully sealed and no dust or gravel can get in, ensuring a longer life,” Joe adds. “If a vehicle breaks down in the hot, blustery desert, it’s not only expensive and hard to deal with from a logistical point of view, but the downtime could also cost us and our client millions, which we want to avoid as much as we can. In that sense, we put a lot of trust in Fuwa K-Hitch and Howard Porter, because we know the equipment they deliver will prevent us from that worst-case scenario.” That’s also why Giacci had Howard Porter fit an automatic greasing system, so the fine dust wouldn’t force the vehicle to stop working due to insufficient lubricating. From the Peculiar Knob mine, Giacci transports up to 180 tonnes of iron ore per load to the Wirrida rail siding approximately 100 kilometres from Coober Pedy. Once it arrives the material is crushed and transported by rail to the Wyalla wharf. Due to the extra demand, Giacci has already ordered three more triple road train sets to support the 14 existing combinations. According to Giacci, Howard Porter and Fuwa K-Hitch will again manufacture in tandem. The three combinations are slated to launch into service by April 2013. “Once the mine is ready to operate at night, that’s when having those extra few combinations will serve us well since Giacci is a 24/7 service,” Joe says. Established in 1959 as a classic one-truck business, Giacci has become a prominent name in the industry, focusing on bulk haulage, handling, storage and civil contracting. Today, it goes by the name the Giacci Group and has expanded its core business to the mining industry. 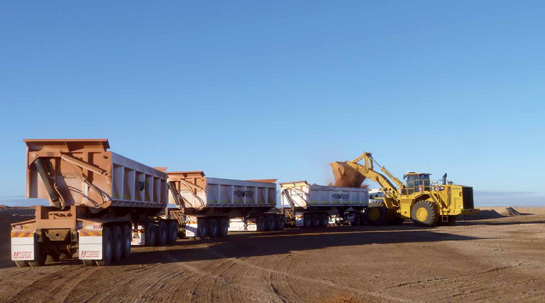 Based in Picton Junction near Bunbury, Western Australia, Giacci operates a national fleet of more than 300 trailers – consisting of side and frontend tippers, skel trailers and belly dumpers that cart more than 18 million tonnes of bulk products per year. In the past year, the company has continued to grow at a significant rate and was acquired by public listed company, Qube Logistics Holdings Limited and its wholly owned subsidiary, Qube Ports and Bulk, in March 2012. According to Joe, the acquisition has strengthened Giacci’s ability to service its clientele clients Australia-wide with superior technology, training and infrastructure, further cementing the company as a leading force in the industry.